In the age of social media, cannabis legalization and culture are receiving unprecedented levels of mainstream attention and discussion. Even in states where cannabis isn’t medically or recreationally legal, marijuana is still a prevalent part of popular arts and culture. Marijuana modeling jobs are a reflection of the interweaving of fashion, social media and business. The current generation of superstar models don’t shy away from admitting cannabis use, and even participate in cannabis-inspired fashion shows and ad campaigns. Before breaking down what marijuana modeling jobs exist, it’s important to understand where marijuana stands in the industry that supports and employs most models: fashion. While there have undoubtedly been many-a-screenprinted-t-shirt with giant cannabis leaves emblazoned on them, high fashion has been largely devoid of cannabis representation, that is, until recent years. High fashion’s very own maven of cool Alexander Wang made history with his Spring/Summer 2016 ready to wear line, where he featured cannabis as the star in some of his most dramatic statement pieces. Celebrities and fashion icons like Rihanna openly embrace cannabis and frequently wear clothing that says just that. As brands like HUF and Adidas popularize consumer apparel inspired by marijuana, high fashion is taking it to the next level. What are Marijuana Modeling Jobs? Frequently, marijuana modeling jobs involve direct sales interactions with potential customers. Models are tasked not only with giving a face to a product, they must also make a compelling argument for why customers need certain products. In these instances, it’s very important that the model be outgoing, engaging and assertive in making sales. As the legal cannabis industry has established itself in major states across the country, companies are searching for the right model to clearly represent a brand, but who can also appeal to a wider demographic. Now that more and more individuals of diverse backgrounds are using cannabis, businesses want to take advantage of new customers. The good thing about brand ambassador marijuana modeling jobs is that it is nearly always a paid gig. Some companies prefer to pay by the day for short-term contracts, while other choose to give models hourly wages for consistent work. This kind of modeling doesn’t have the high payouts of commercial fashion, however, brand ambassadors have the ability to make up to $20 per hour or more for their services. In-person modeling for products or services requires a strong aesthetic presence, but also strong communication abilities and a memorable personality. Some models work exclusively as brand ambassadors, representing different industries with this unique, charismatic skillset. For those interested in working primarily in commercial print modeling, many of the most popular cannabis paraphernalia and apparel brands require models who look good on film to win over viewers. Unlike modeling as a brand ambassador, commercial print requires models to sell a product with their face and essence in a photo, rather than through direct sales. Commercial models are often represented as stereotypes of stoner culture with iterations on hippies and counter culturists. Now, mainstream commercial print modeling encompasses a wider variety of different looks in order to be relatable to more individuals than before. Commercial print modeling is part of the advertising and marketing process–the models who are chosen for projects are done so to move the cannabis industry in a progressive direction. Commercial print models for major publications have the potential of earning hundreds of dollars per hour per shoot, or thousands per day. Obviously, these circumstances are more few and far between, but print models can still bring home several hundred dollars after a shoot. Finding marijuana modeling jobs can be difficult, since both the cannabis and modeling industries are notoriously competitive. Most working commercial print models are represented by modeling and talent agencies, which send models on casting and facilitate shoots. Though not a conventional path, social media marijuana modeling jobs are giving models a platform to build a brand and make money by establishing a social following. 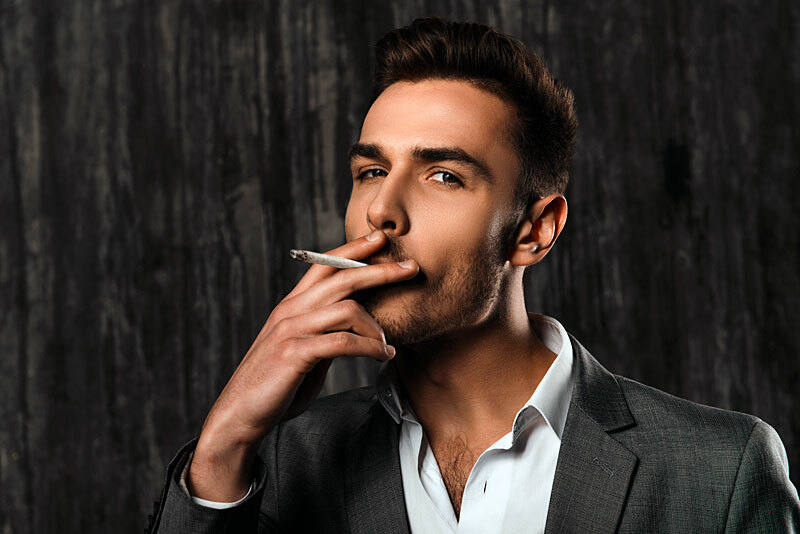 Entire social media accounts are dedicated to frequently posting and updating photos of models smoking, consuming or interacting in some way with cannabis. Social media models have introduced a much wider audience to cannabis as a legal, marketable industry. By increasing exposure, the cannabusiness is further strengthened and influences the rate at which further legalization measures could be adopted. Social media models aren’t automatically guaranteed compensation just by uploading pictures to sites like Instagram, however, as a model’s profile gains more recognition and their following expands, greater opportunity for sponsorship opportunities present themselves. Social media has been a primary path on which current mega-models like Hari Nef and Gigi Hadid found their success. Successful cannabis entrepreneur, photographer and Instagram model Bess Byers “imcannabess” displays her talents behind and in front of the camera to her following of over 25,000 dedicated fans. Byers is a perfect overall example of marijuana modelings jobs, since she uses all the skills at her disposal to build a successful brand. Becoming a social media cannabis model requires self-starters who are confident in themselves and their love of cannabis. From here, models are charged with finding a marketable point of departure for attracting followers to their page. While some models take the selfie route, others strike poses in high fashion inspired ads. The journey of a social media model is varied, and there are a lot of cannabis models competing for the attention of the online world. What makes a model successful is the uniqueness of their look in addition to their inclusion of intriguing cannabis products and paraphernalia. While each of the marijuana modeling jobs above portray the legal cannabusiness in a different perspective, it is not to be underestimated how models can shape the way not only media, but corporations and government view cannabis. The most famous fashion models throughout history were celebrated not just for their faces, but their charisma, growth, versatility and evolution. Now more than ever, the cannabis industry needs support from all corners of the world to allow for the continued development of the industry.